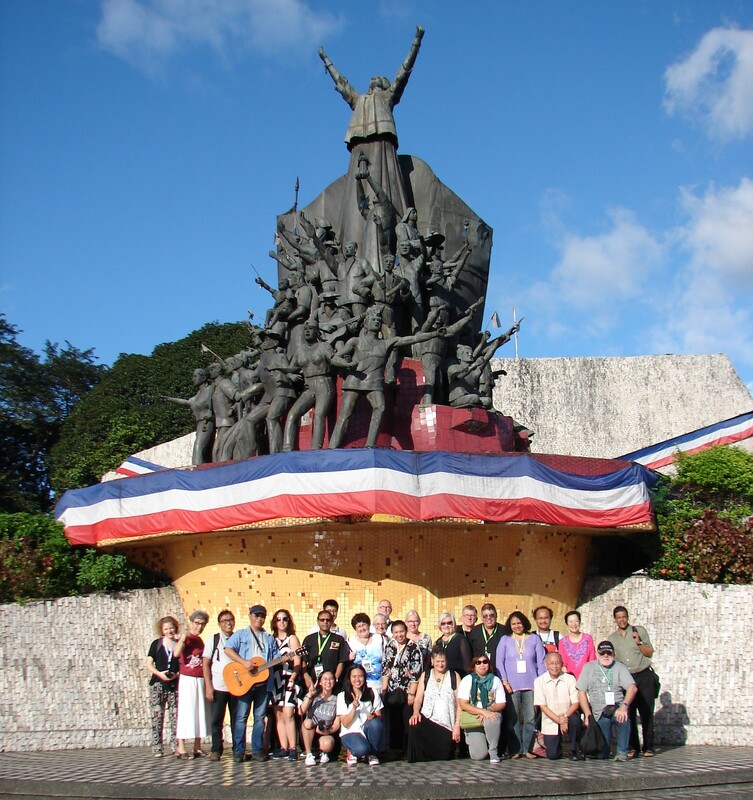 During the recent consultation with member organisations of Pax Christi International’s Asia-Pacific region, consultation participants visited Bantayog ng mga Bayani, a museum commemorating the struggle against martial law in the Philippines. When Ferdinand Marcos declared martial law in 1972, our docent, Susan Macabuag, had been a student at the University of the Philippines. At the time, students were the most vocal opponents of martial law because they foresaw the danger it posed to democracy. Under military rule, it was illegal to hold gatherings of three or more, or to express political dissent. Liliosa Hilao, a 23-year old student activist, was the first person to die in detention under martial law. Many others were disappeared or tortured. Perhaps the most shocking death would take place thirteen years later when government forces assassinated the opposition leader Ninoy Aquino upon his return to Manila. The extended period of martial law became an opportunity for the Marcos family to plunder the wealth of the Philippines, turning it into one of the poorest countries in Southeast Asia. The Presidential Commission on Good Government estimated that Marcos stole as much as 10 billion USD from public coffers, which is still mostly unaccounted for. Marcos used the money to buy off his cronies in the military and the police. Martial law also benefited the capitalists because workers could not collectively organize, and guaranteed that U.S. military bases could remain in the Philippines. Perhaps martial law would not have lasted as long without foreign backers of the regime. The museum invited reflection on the legacy of colonialism and how it created the type of society in which martial law could take hold. Spanish and American colonialism, both political and economic in nature, created a feudal system where the majority did not own land or resources, while a small minority had access to education. During the Second World War, Japanese occupation brought about massive urban destruction. The language of imperialism continues to shape public discourse on the West Philippine Sea, and even used to deflect human rights criticism from the international community. Our visit was well timed: the following day, November 30, was a national holiday commemorating Andres Bonifacio, who sparked the Philippine Revolution against Spain in 1896. In 1986, it was nonviolent resistance that toppled the Marcos regime. The Catholic Church played a significant role in providing the civic space and coordination for the diverse opposition movement. The opposition movement included workers, professors, teachers, students, farmers, public servants, businessmen, professionals, artists, journalists, and religious. One notable woman religious was Sr. Mary “Christine” Tan, provincial of the Religious of the Good Shepherd. In a vocation story published after her death, Sr. Christine confessed that the institutional Church had vigorously opposed her political activism. A Cardinal had summoned her to Rome only to threaten her with excommunication if she did not cooperate with the Marcos regime; she disobeyed the order. Sr. Christine would go on to help write the new Philippine Constitution and found the Pax Christi section in the Philippines. After paying our respects to the martyrs and heroes inscribed in the Wall of Remembrance, we visited the EDSA Shrine and People Power Monument. Both commemorate the historic thoroughfare upon which half a million Filipinos descended to signal their nonviolent opposition to the Marcos regime. In doing so, the people created a great tension; the military chose to defect from the Marcos regime rather than fire upon civilians. Although it had been used to suppress the people during martial law, the military has since undergone a transformation and is now widely respected as a professional institution. However, some question whether the imposition of martial law in Mindanao, which has lasted more than six months, is a portent of further challenges to civil-military relations. The only thing we can be sure of is the revolutionary power of nonviolence. In her vocation story, Sr. Christine Tan, RGS, wrote: “There was perennial search in all waves of my life – the search to find God, the search to be authentic, the search for justice within and outside the Church, the search for true freedom, the search of my people for a taste of a life that is human.” In their continuing search for these ideals, the Filipino people serve as an indefatigable witness to Christianity in Asia and a paragon of Gospel nonviolence. This exposure trip refreshed the Pax Christi members with a measure of hope, linking this experience to the work that we have been doing for peace and justice. It influenced our final statement of the Asia Pacific regional consultation, which can be read here.